Just came across a string of photos taken by Joseph Rivera – director of science and technlogoy at SCAA. 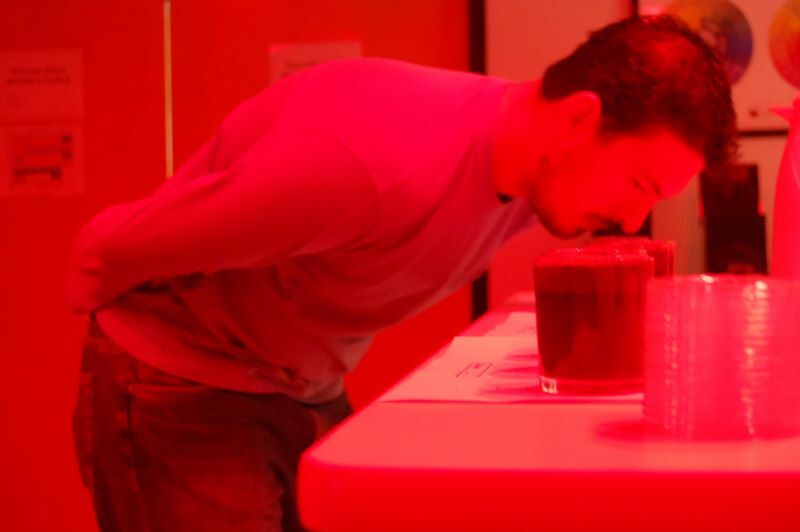 He also takes joy in administering the famous SCAA sensory skills exam, one of many required to be a Q grader. If you want to take or retake this, it seems the next oportunity to do so is this Saturday March 17, 2007 in Petaluma, CA. We used red lights at times to hide variation in color. For example with la nez du cafe some oils are darker or yellower, and also when doing say a set of 6 triangulations, some roasts may be slightly lighter or darker. This was intended to iron out variations visible to the eye. It mostly worked. You can also purchase La Nez from SCAA. Click here for more of Josephs pics taken that week. He did some amazing things to demonstrate different organic acids.